Probably one of the best/worst things about running an app agency is that you quickly realise that almost everybody has an amazing app idea which they want to share with you. And while most of them are solid, useful, potentially profit-making ideas, a lot will be fundamentally flawed in one way or another. One of those common flaws is the user engagement strategy. That is to say, what strategy do you have (a) to get the user to download your app and sign up, and (b) to keep your users coming back for more later. We’re going to focus here on the first of those two - which is user acquisition. And specifically we are going to look at platforms which have 2 (or more) types of users. We were approached by Juan Criollo, CEO of Open Music Project in 2016 about building for them a new app to bring together musicians. A specific place where musicians can come together, find others to play music with, and form bands. Our first step when validating the ideas of our potential clients is to make sure the idea either doesn’t exist or is an improvement on what currently exists. So we did our research and waded through the many different apps and websites which have a similar offering to what Juan was proposing. Some were focussed on a feed, where users can view the activity of other users. Others were focussed on music, or style, or skills. There didn’t seem to be one specific app which was leading the market — meaning most users probably download the one that their friends have recommended as opposed to the one that offered the best experience. With so many of these apps on the market, we would need some solid functionality to really draw in the new users. Our challenge was to find some offering that would be powerful enough to persuade a user to download the app. Something tangible which would make them say “it is worth 5 minutes of my time to download, sign up and start using the app”. We started by researching in what areas these existing apps are letting their users down. We read through app reviews, and spoke with users of the apps themselves. “Does the app you use make it easy for you to meet new musicians and play music together?”. And whilst some of these apps have very powerful features, the majority were failing at that task. “So how do you meet other musicians?”. Most people told us the same thing — by pinning adverts to a message board at their local recording studios. This incredibly primitive manner of communicating with other was still the main way musicians connected with each other. So, how can we take that idea and put it into our app? We started by breaking down what was actually happening here. Firstly, the bands that were looking for musicians actively advertised their requirements i.e. “we’re looking for a new drummer.”. And secondly, the people who are interested in potential collaborations would go to the board to see what was on offer. This idea that users were “advertising” specifically what type of collaboration they were interested in was something we hadn’t seen in any apps. So we began designing the app. We knew that for Bandwidth to be successful, we’d need to offer something they can’t get in the other apps. Otherwise it just isn’t worth their time downloading and signing up. We decided to make this concept of “advertising your needs” a fundamental part of the app. When a new user creates an account, they’re asked if they would like to create a profile. And, just like the other apps, users can add photos, music, information etc to their profile. We also ask you to add which musical skills you have (vocals, drums, guitar etc.). But the killer feature we have introduced is the ability to say directly (a) if you are open to playing with other people, (b) what skills you can offer to other bands and (c) what types of musicians you are looking to collaborate with. With this information, embedded right into your visible profile, we are able to immediately match you with other musicians. If you’ve said you’re a band looking for a drummer, we have easy access to a bunch of musicians who are open to playing drums with other musicians. We also added a feature to search easily for users to quickly search for exactly what they need, and return only the profiles which matched. 18 months after launch and our platform has tens of thousands of users, thousands of DAU and profiles all around the world. In order to validate that our features are working, we’ve built custom analytics that tell us when users are contacting other users because of our matching service — and the result proves that it is a feature that works. User feedback servers have indicated that musicians are meeting, bands are forming and connections are being made through the app. 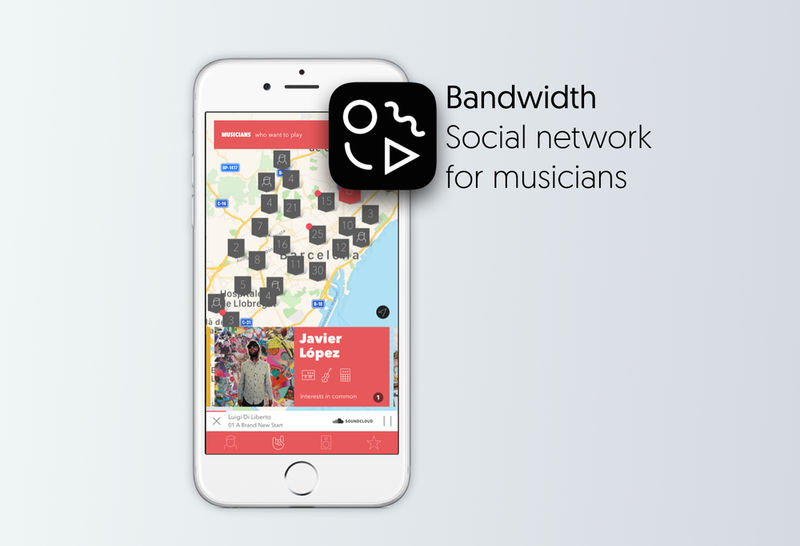 We’ve even been contacted by bands who credit Bandwidth as being the app which helped bring them together. Not one to sit on our laurels, we’re busy building new features right now. Once again, we’ve gone back to the drawing board to see what we can do to make musician’s lives easier and better. We’ve surveyed our users, and studied the app market again. We’re still focussed on bringing people together, but this time we’re moving our focus towards helping musicians make a success of their work. Taking musicians from the point of just casually making music, towards a point where they can start playing professionally. Helping to develop careers in the music industry. And maybe one day we’ll see a Bandwidth band killing it at a music festival. Duncan Campbell is CEO of Gorilla Arm, a mobile app development studio.